Now I have a permanent and daily reminder of our little angel. And someday we will tell Noah about his big sister watching over him from heaven. Beautiful tattoo! I love it. I love looking at the tattoo I got for Jacob and I've never regretted it. Lovely! What a beautiful way to remember Olivia! 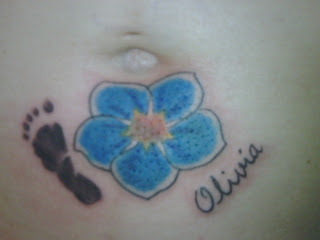 I was just googling tattoo idea's and I came across your picture and went to your blog. My husband and I just lost a baby at 22 weeks due to amniotic band syndrome on May 1st.. We named him David. Thank you for posting this.